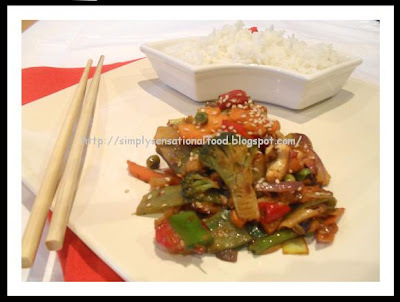 Sweet and sour sesame vegetables- A medley of colourful vegetables stir fried in a Chinese style sesame sweet and sour sauce. Delicately flavoured with dark soya sauce and sweet chilli, it makes a lovely accompaniment to plain boiled or egg fried rice. 2 small button mushrooms sliced. 1. Prepare and cut all the vegetables so that they are similar sizes. 3. Remove cashew nuts and keep aside. 4. Add the sesame oil and add the garlic ,chillies and all the vegetables. 5. Stir fry the vegetables on high heat for 2-3 minutes. 6. Add the Soya sauce, honey ,lemon juice and sweet chilli sauce . 7. Add the salt and stir in the sesame seeds and cashew nuts prepared earlier. 8. Stir fry for 2-3 more minutes. (Vegetables should just wilt but still be crisp and retain shape. 9. Transfer to serving dish and sprinkle with few more sesame seeds. Serve with plain boiled rice or egg fried rice. 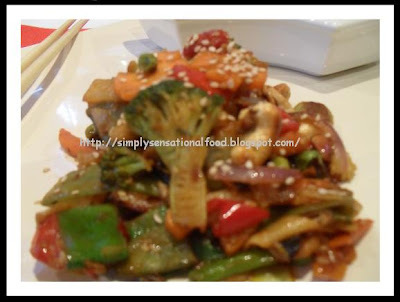 NB- Vegetables can be varied according to what ever is available or preference, careful with salt as soya sauce is already salty.If you don't have sweet chilli sauce add 1 tablespoon tomato sauce and extra chillies instead. Tempting veggies, slurppp! !makes me hungry..
i have almost all the ingredients in hand.going to try this for sure. Congrats on being featured in the magazine! Love the second click. Pl, do come & collect!